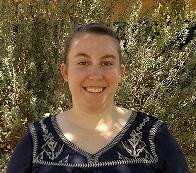 After many years without one, UCCE-Imperial County hired a new livestock advisor. Brooke Latack graduated from Michigan State University with a B.S. and M.S. in Animal Science, focusing on the environmental impacts of livestock production. She worked on projects involving a broad range of management practices and integrated interactions between crop and livestock production to understand the sustainability of animal protein production. She plans to help producers in Imperial, Riverside, and San Bernardino counties through programs covering livestock nutrition, management techniques, environmental factors affecting producers and the community, and other critical topics. She looks forward to meeting producers and community members to help develop strong relationships and provide meaningful programs. Brooke can be reached at (442) 265-7700.